Who cares… It’s the 0.001% of the community… and they are literally your biggest fans… Better tend to that other 99.999% that’s not happy with the current situation. Wait until you to 5th wing or higher. It’s much worse. Well if people are doing it in half the time that some others are, good for them. 1, they are better than that other person or 2, they invested their time more wisely. It doesn’t matter me. My rank is for my personal satisfaction and I am glad I have something to work towards until the release of the next title. I don’t understand why you are so displeased with others being upset with their time invested into a video game. You will never please everybody, especially in this community. Some people hit diamond rank in a weeks time, while others work towards it for entire season. Is it unfair that some are more skilled then others? Is it unfair that th minority has access to diamond skins? No I don’t think so. Why should you care unless you are envious of others talents and/or availability to have more time to play? ?.. I wasn’t implying that someone achieved the same rank because they were better in skill… I was implying that, in this hypothetical, it only takes roughly 5k hours to hit max rank, and the lone guy at the top who’s sank 10k in feels cheated… and I’m saying you’ve got your priorities mixed up if you think you should cater to that guy vs a very large group. Well they should cater to the majority. They would most likely as a whole be dissatisfied. But that doesn’t mean they have to give them everything they want. So… The majority wants this, the dev should give the majority what they want… but no,… because you can’t have everything you want… and we have to please the 10 people that have 10,000 hours invested… I’m telling you, you’ve sunk your argument with your own words. You’re just arguing to argue at this point >.>. Please feel free to try again, when your “solution” doesn’t involve leaving the majority of the community disappointed. I agreed that a majority does need to be pleased and I own up to that I said that. But at the same time the majority opinion doesn’t matter when it comes to something that is a reward to few. You are taking anything that I say to agree with you to prove your point but you keep taking it out of context and leaving out anything I have said that does not cater to your opinion. You are arguing for the sake of arguing. Plain and simple, max rank isn’t for the majority even if they don’t like it, it’s not for me and it’s not for you! Get over it! That 99.99% you speak for will get over it! Option A) the 00.01% of the players will feel cheated because they share max rank with others that have less hours. Option B) the 99.99% of players will feel dissatisfied because achieving max rank is more or less impossible. You believe Option B is the better of the two, right? They should not concern themselves with the majority on this subject! You’re not answering my question… I don’t care what you personally feel. It’s irrelevant. The vast majority DOES feel a certain way about it, otherwise this thread wouldn’t exist, so why don’t you choose from the two options up there. I don’t even have to say anything… I mean you contradict yourself here, straight up, when you said they should please the majority… and if you believe pleasing that 00.01% is more important… Okay… lol. I haven’t contradicted myself at all. I have been very clear on my stance. You are over here giving some very strict guidlines of what people are feeling and expect me to choose from A or B when it is far more complicated than that. But hey we live in America, let’s reward those who don’t work hard as much as those who work smart and harder! You either have no understanding of what you are talking about or just trying to get people riled up. But you can defend this supposed 99% that you speak for! Hey let’s just hand out seriously 4.0 to everybody since you played our game! We wouldn’t want that 1% to be lonely! But I’m asking you. What do you think the majority would feel if 10,000 hours were required? And my last question to put the nail in the coffin for this one, who do you think the dev should cater to more? the 0.0001% that can give 10,000 hours to their game, or to the 99.9999 that are going to feel dissatisfied? Let’s not forget everything in middle of all those quotations, but that’s fine. I guess we can’t have any dissatisfaction in life. Boo hoo to all those people who’s lives are ruined because they feel that 1000 hours is enough for them to get the max reward. What are you 15 and feel that everyone should have everything without any hard work? i will take seriously 4.0! i deserve it for putting the disc in! Lol! Thank you for the laugh! Late to the conversation and it has probably gone off track because thats just how it goes but honestly just finished a 50 wave Inconcievable run and the XP movement was very unsettling. I was level 77 Wings 5 or 6 (honestly dont know what wings am I anymore lol) and by the end of the match even with the XP bounty I didn’t even come close to 78. I think we need a continuous XP boost because I do not have that kind of time and there are other games lol. Surely the time is right to have a permanent xp boost of say 4 x per match. As everyone (mostly) is saying the return to standard xp is somewhat disheartening. Based off of the thumbs up I have recieved in the thread at this time, it looks like you are the minority. Logic isn’t on your side today friend! It got me thinking… Wow… those likes came really quickly and out of nowhere… And you picked up on them so fast!.. 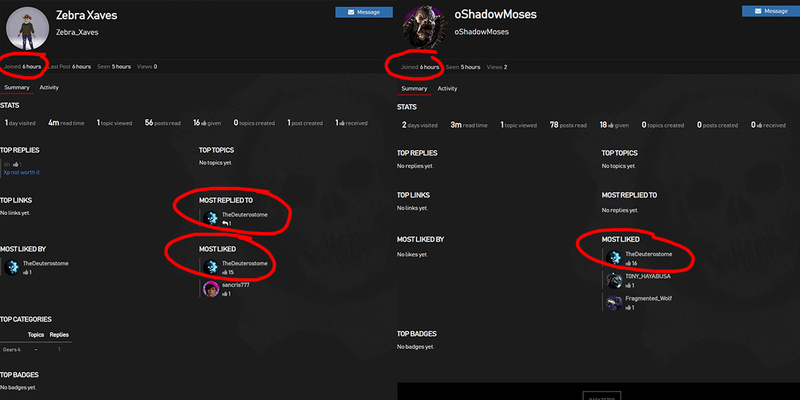 Then I thought hmmm… Maybe we should check out these profiles… And oh, look at that… both of these profiles were made the exact same time, (Not days but hours ago), they both wound up on the exact same post… and to make things even WEIRDER… they both share your opinion and decided to like all your posts! One even traded a little friendly banter with you… Wow! The coincidences are almost unreal! May I suggest, the next time you’re compelled to beg your friends to act like strangers and back up your points on a forum because you’re not confident in your words alone or feel like you’re sinking… Just don’t. It’s really sad…Thanks.